Although the writing of this has been delayed by being very busy, I wanted to make sure I took the time to give a rundown of our adventures in the Philippines! Marcy and I spent our last 3 weeks of travels in Palawan in the Philippines, a popular place among Filipinos for holidays on the beach. We started in the north in Coron, where we spent our first day snorkeling and island hopping, exploring nearby treasures. 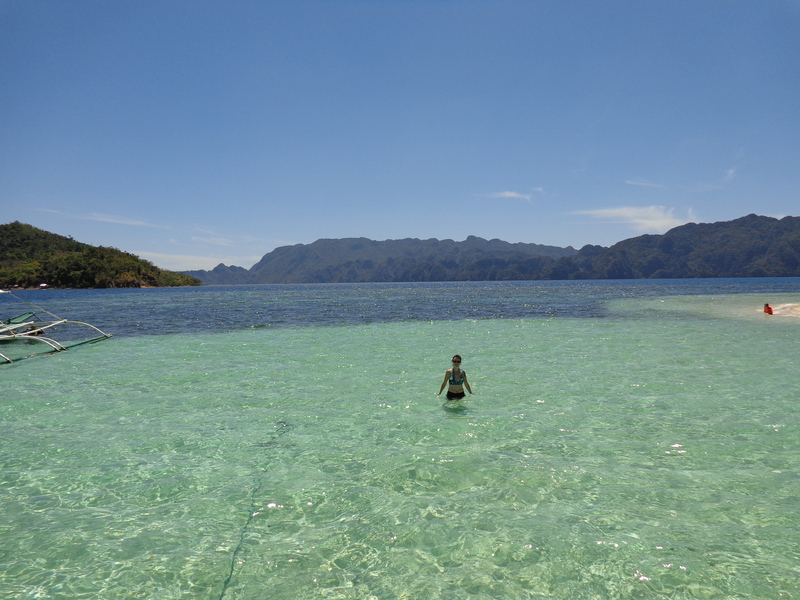 Over our whole time in Palawan, we did four of these island hopping trips, in Coron, El Nido, Port Barton and Puerto Princesa, and I think we had the best time in Coron, thanks to the relative lack of tourists, lovely jellyfish-free waters, and the fact that it was our first! In El Nido, because it was the week of the Easter holidays, there were loads of Filipino tourists all doing the same tours, and having 100 people climbing through the rock opening to the “Hidden Lagoon” takes away some of the magic. Port Barton should have been great, but we were plagued by some wind and rain, and the number of jellyfish in the waters put us off. 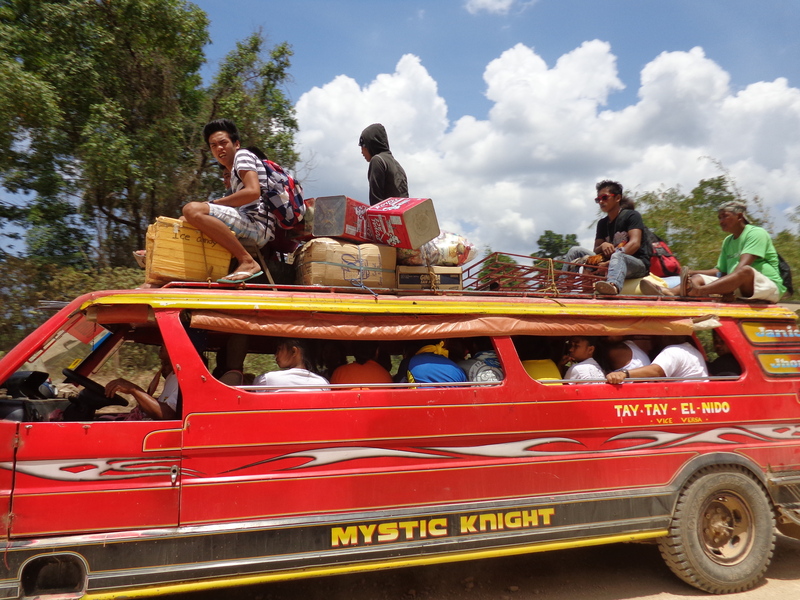 In Puerto Princesa, the island hopping is a totally different scene. Instead of going to small, remote seeming places, you are crowded into a roped off area to snorkel or swim, with lots of other boatloads of people. 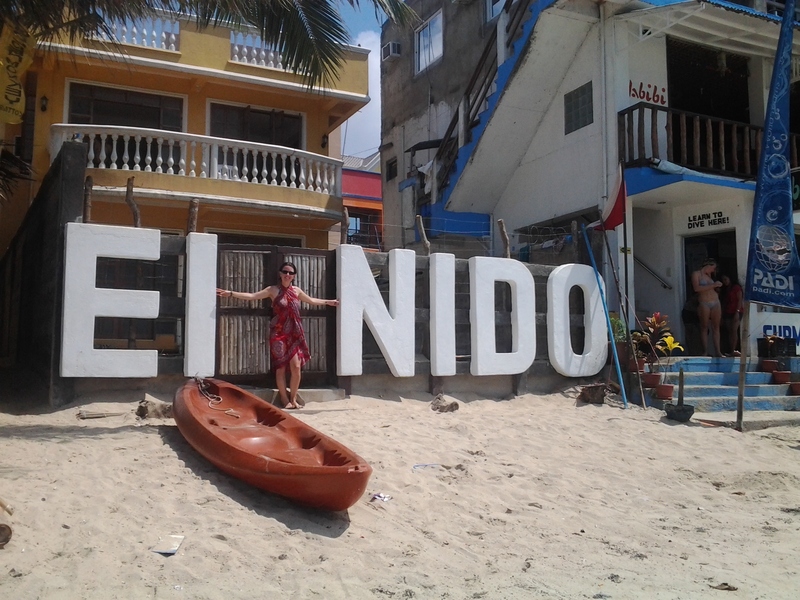 As far as cool little towns on beaches go, El Nido is one of the best. The beachfront is lined with hip little restaurants and bars, with everyone offering happy hour specials as the sun goes down. We spent 5 whole days here, a long time for us, and we took a kayak out one day to find our own private beach not too far away, and a motorbike another day to a long, white-sand beach that was practically deserted. Although a popular place for Filipinos, it doesn’t have the crazy tourist scene that Boracai is known for, so it was very relaxing. We spent several lovely days at Coconut Garden, a boat ride from Port Barton, reading on the beach, and this place was also one of the highlights of Palawan. Structured like a resort, but within affordable price-range, the hotel with its restaurant is the only thing on the beach, and boats are needed to get there and around. These two places are the more populated and well-known parts of the area, with the extensive underground river being the most popular tourist attraction. We did the tourist bit, taking the boat on the river tour, as well as visiting the mangrove forest, but overall, it wasn’t our favourite place, being a bit dirtier, noisier and less relaxing. We ended up in these two places longer than we would have liked. Compared to Vietnam and Laos, food was more difficult for us in the Philippines, and it was tough to find vegetarian options. Even though we were open to eating fish, and were situated right on the ocean, fish wasn’t always available because of the weather. Our saving grace in Puerto was the vegetarian restaurant, Ima’s, where we ate nearly every day (once, twice in one day). As is touted in guidebooks and on t-shirts, Filipino people are very friendly and outgoing, usually with a big smile, which was really great, and they speak English, which does make travelling easier. Also compared to our other travels in SE Asia, the beaches and water were very clean in Palawan, which was really nice to see. But it was also much more expensive than our first few weeks, so our accommodation went down a star or two. 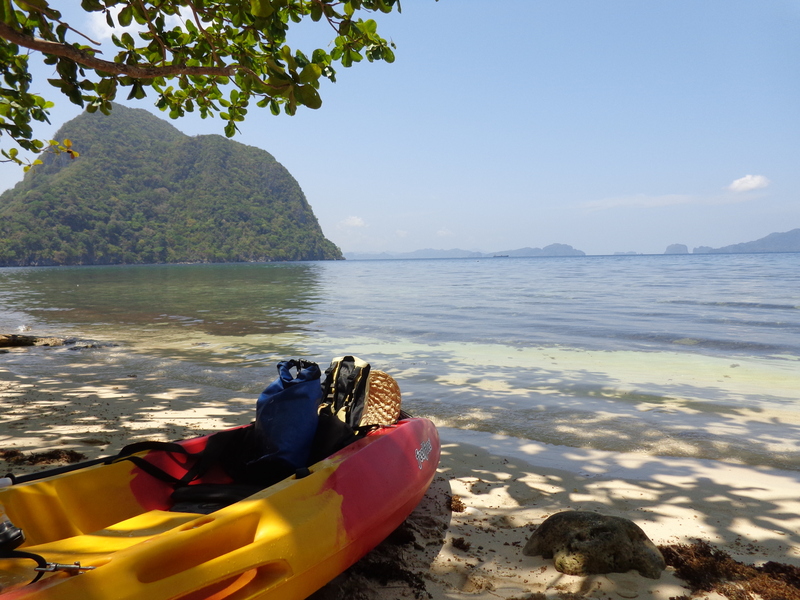 The Philippines was a great place to relax on the beach, although if we were to do it again, we’d move around a bit more, not just stay on Palawan, which we had initially chosen because we had been moving around so much in Laos and Vietnam. But we had a great time there overall. 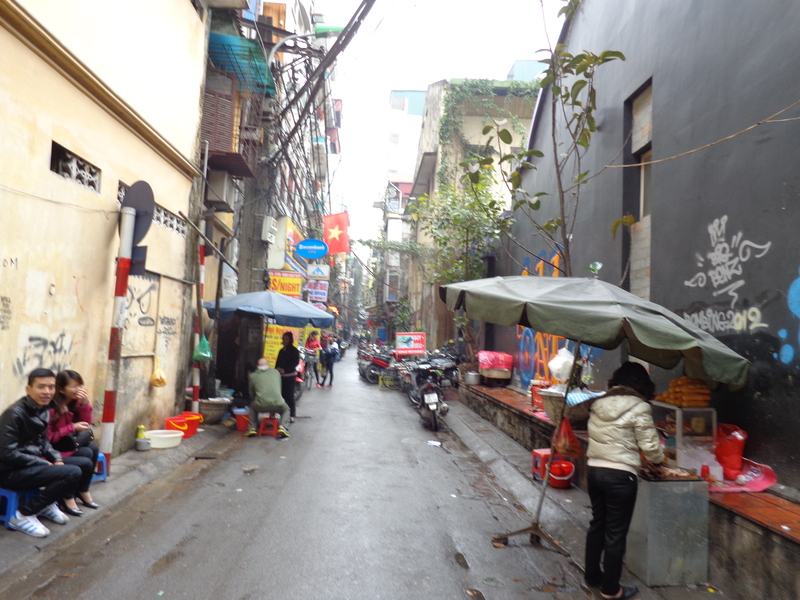 The last week on this stretch of our trip was spent back in Vietnam. 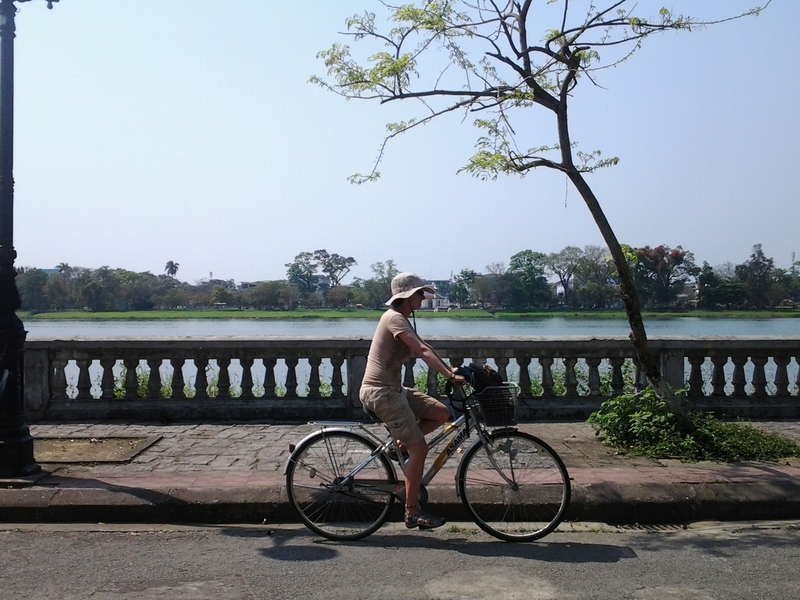 We crossed from Laos in an uneventful, if long, bus trip that got us to Hue. As expected, as soon as we crossed into Vietnam, the traffic became noisier (they don’t use the horn much in Laos; it’s used every 10 seconds in Vietnam) and everything just felt more chaotic. We enjoyed a day in Hue, staying at the very friendly and quirky-named Google Hotel. We rented bicycles for the day and negotiated the thousands of motorbikes to take a look around town and visit the citadel. 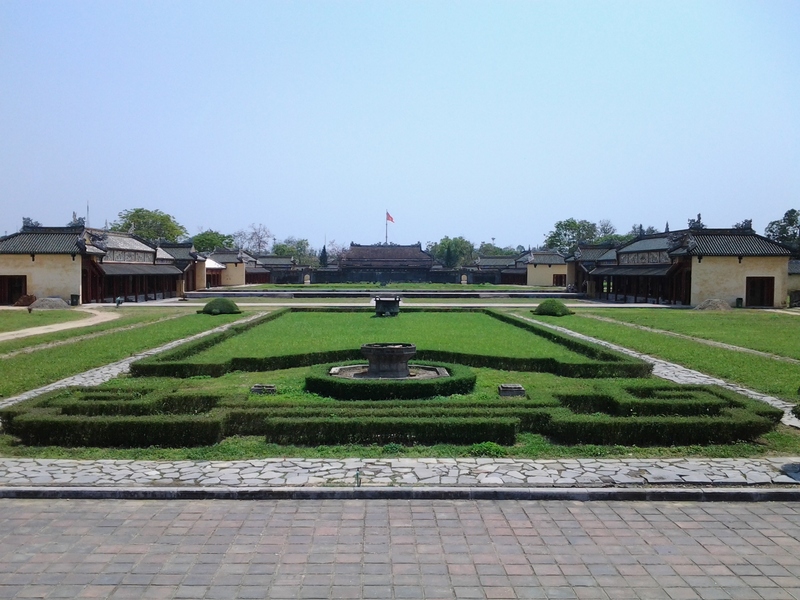 Hue was the capital of Vietnam for a period up until the mid-20th century, and a palace area was built for the emperor. It was largely destroyed during the war, but is being restored. 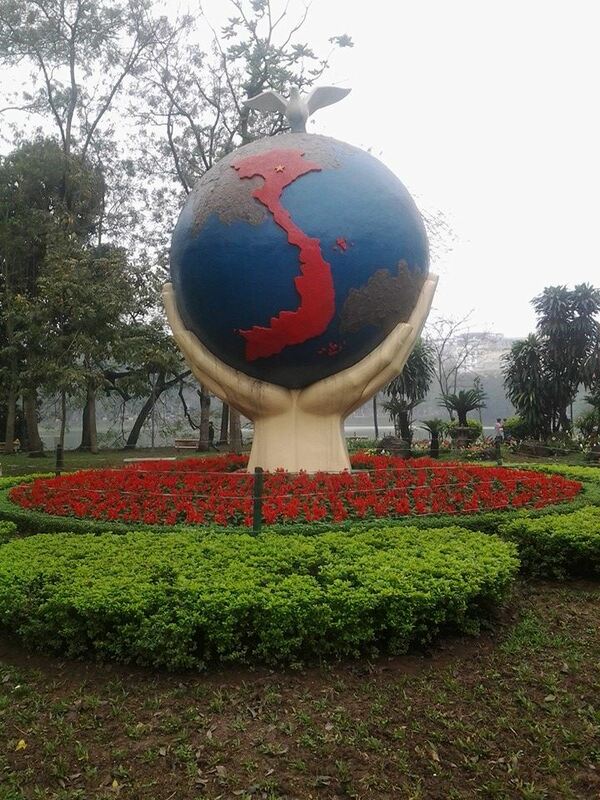 I had visited Hue on my previous trip to Vietnam in 2006, and it seems that they’ve done a lot of work on the citadel area since then. After a day in Hue, we left for Hoi An, where we stopped for 3 nights. Hoi An is famous for its shopping and its tailors. Everywhere you go, there are tailors who will make any clothing, from suits to wedding dresses to shoes, tailored to you, at a fraction of the cost of home, good quality (if you look for it), and in short order. Many people plan to end their trips in Hoi An, and if we were doing that, we no doubt would have been sorely tempted to do more shopping. Aside from the shopping, Hoi An was lovely to walk around, with quaint alleys and old buildings. We spent a lovely day on the beach, our first serious sun exposure resulting in the predictable sunburns, despite our SPF 50.
enforcing the lights-out policy everywhere. And sure enough, at the appointed hour, a siren went off, and every restaurant, shop and business shut off the lights (at least the ones visible from outside). It was quite interesting to watch, and it seemed that all the town’s youth came out on the streets. The pedestrian areas by the river were packed, we were hardly able to move about, and the women selling candles in paper containers, which you release onto the river, did a booming business that night. After Hoi An, we took a night train, then a series of busses and a boat to get back to the north and over to Cat Ba island. The town had just finished a festival the day before we arrived, and had the feel of a town-wide hangover. We found our cheapest accommodation yet, in a room with a balcony overlooking the harbour – unexpected off-season bonus! 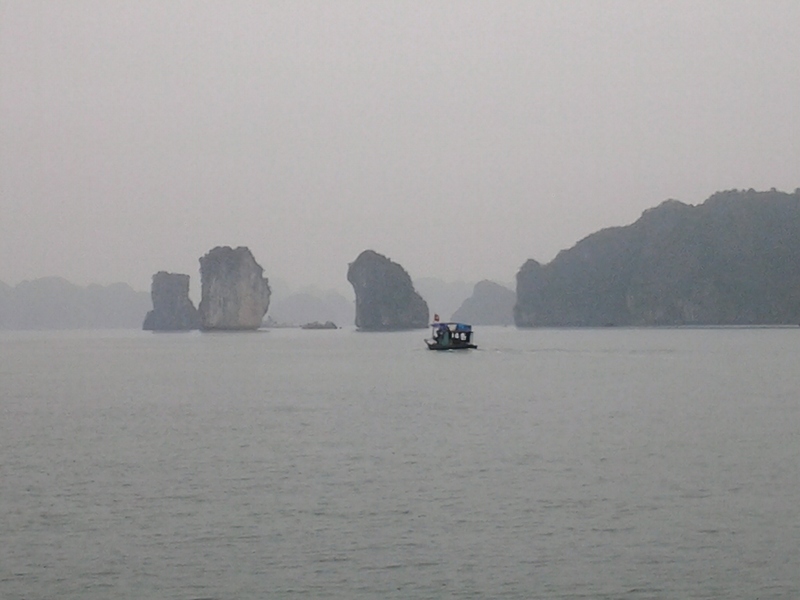 The reason for going to Cat Ba was to explore Halong Bay, an iconic place that I had always wanted to see. 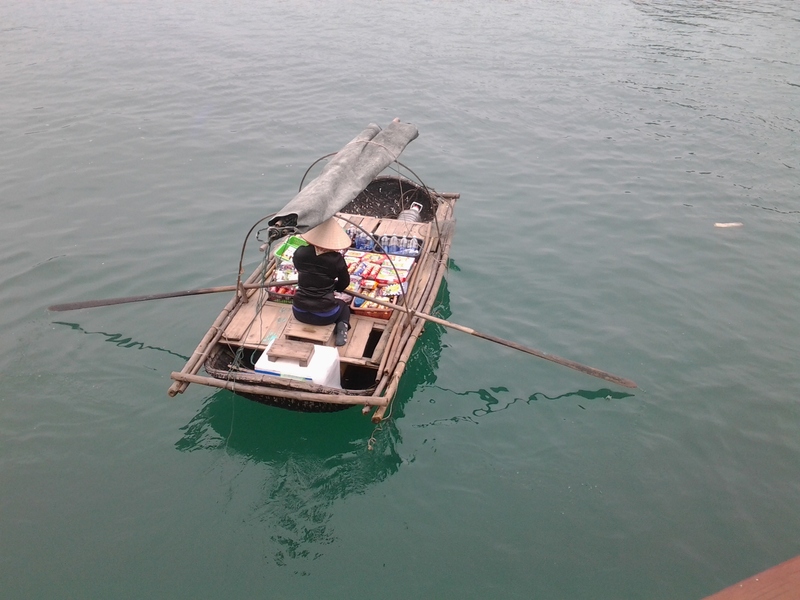 By starting at Cat Ba, we were a bit farther from the tourist throngs of Halong city, and booked a lovely day tour on a boat of Halong Bay and Lan Ha Bay. The boat took us around the beautiful rocky islands, stopping for an hour so we could kayak under outcrops, explore small bays, and traverse through mini caves. After a freshly caught seafood lunch, we explored more of the bay, stopping for a swim (which only a few of the braver souls attempted, given the chilly weather). We lucked out with the weather, being overcast most of the day but with decent visibility and even some sun in the afternoon. The trip was a highlight, being a destination on my list for years. Heavy rain the next day drove us back to Hanoi for our last full day in Vietnam, where we did a bit of wandering and had drinks with friends. Then, off to the airport – with a one night stay in Bangkok before our next adventure, the Philippines! 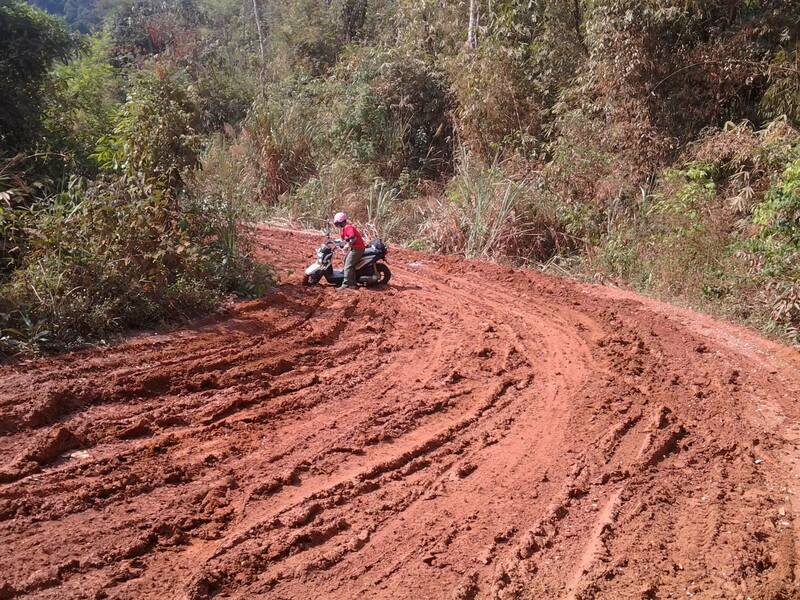 One of our most fun adventures to date, in my opinion, was this 4-day motorbike loop that we undertook outside of Tha Khaek, Laos. A popular and well-know circuit, the adventure starts in the small city of Tha Khaek, and circles a few hundred kilometers around, passing through numerous villages, rice paddies, and an endless amount of stunning scenery. We went on this little adventure accompanied by Sandra, a German girl traveling on her own, and the three of us had a great little adventure on our rented, fully automatic, real-Honda 100cc bikes – this distinction is important, in light of the fact that most bikes you can rent are low-quality Chinese bikes that are as likely as not to break down, and for inexperienced bikers like myself, the fully-automatic feature was helpful (although I have managed a semi-automatic successfully). The first day of the loop was pretty easy riding, on nice paved roads that wound through some of the most amazing scenery I’ve ever seen. Dramatic, rocky mountains rose up around us, covered in lush greenery, and we had a surprisingly clear day, having mostly dealt with a haze created by the constant burning in the countryside (slash and burn farming). It was tough not to stop every 5 minutes to take more pictures. 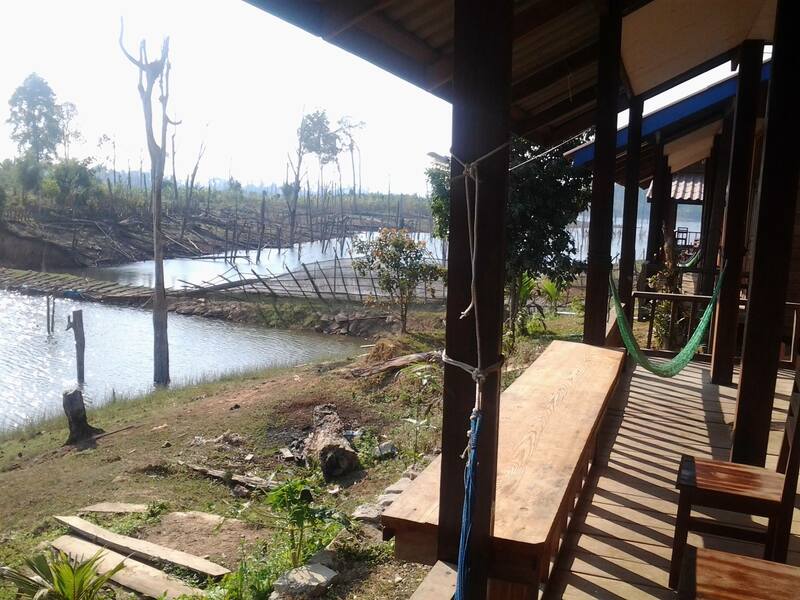 By late morning, we arrived at an area where the Nam Theun 2 hydropower dam had drastically altered the countryside. We stopped at the visitor’s centre to learn more, and certainly it is an interesting project, providing carbon-cleaner energy primarily to Thailand. But you could also see the destruction it had imposed on the landscape – on one side of the road, beautiful, untouched jungle, and on the other, a massive lake filled with dead trees where the damming of the river had flooded the valley. With growing energy demands in Asia, Laos has taken on quite a number of damming projects to provide this electricity to it’s hungry neighbours, and though I do think it’s better in the long run than burning fossil fuels, one can only imagine the long term effects of this kind of disruption to fish and other wildlife. When we had been sitting in Tha Khaek planning our loop trip and reading the book of other traveler’s experiences, we had shunned the idea that we needed warm clothes – when you haven’t experienced temperatures below 25 degrees celsius in nearly a month, it’s very difficult to believe that you will ever be cold again. And certainly, being at the end of the dry season, we did not expect rain, at least not more than the short 20 min showers we’d had a couple of times. So we were shocked when, after spending a lovely evening (in a power outage, by a campfire) in Thalang village, the rain started coming down in the morning, accompanied by strong winds, and didn’t let up until 2pm. We were completely taken by surprise, and sat with 3 other stranded travellers playing cards, feeling cold and annoyed at being unable to leave. When the rain finally did let up, our little scooter gang of 3 took off, trying to make it as far as we could before dark. The rain, of course, turned what we had expected to be a very dusty stretch of road into – surprise surprise – a muddy one. We had been prepared to have a stretch of bad roads, a part of the loop that is under construction and is really only red dirt. While others had warned us of deep dust holes, we were faced with deep mud, no traction, and a lot of cursing. Sandra, experienced with riding scooters in Germany, sailed through the stretch of road, and we didn’t see her again until the end. Marcy was the first to go down, losing her grip on her bike and sliding sideways. I went down a little while later. Luckily, we were travelling at less than 1km/hour, so injury was never a concern, just extreme frustration and very muddy shoes as we repeatedly spun our wheels trying to get up hills, and slid sideways going down. If it hadn’t been for a friendly older local man (with few teeth, zero English, and wearing flip-flops), who took turns pushing Marcy’s bike then pushing mine to get us through the deeper spots, Marcy and I may have just given up and slept by the side of the road. But the Lao man did get us through, we we happily bought him and his friends a couple beers at the village at the end of the terrible road, where we used sign language to have minimal conversation and lots of laughter. We didn’t linger long, because we still had a lot of kilometers to cover before dark, so we left them to their beer and road a cold, bumpy and tiring hour or two to the very uninspiring town of Lak Sao, arriving grumpy and exhausted. The weather was in our favour the rest of the trip, and we left the next morning on nicer roads. Our morning destination was a place called Cool Springs. I had directions: travel 34km past Lak Sao, look for a sign pointing to a village 3km away, drive all the way to the river at the base of the mountains, then follow the path to the springs. Sounds easy, right? We got as far as the river OK, where we parked our bikes and waded across the muddy river. But at the other side, we couldn’t find a sign of a path. We wacked our way through low, sparse brush for about 20 min, looking for the path, and were about to give up when I found it – pretty obvious path, but we’d crossed the river at the wrong point. OK, so now we were on the path, walking through dry, cracked farm fields, along the side of the mountain, but we could not find the stupid springs! Not a sign of water anywhere around the mountains. An hour and a half after starting out, we returned to our bikes. It was a lovely walk, but no springs! 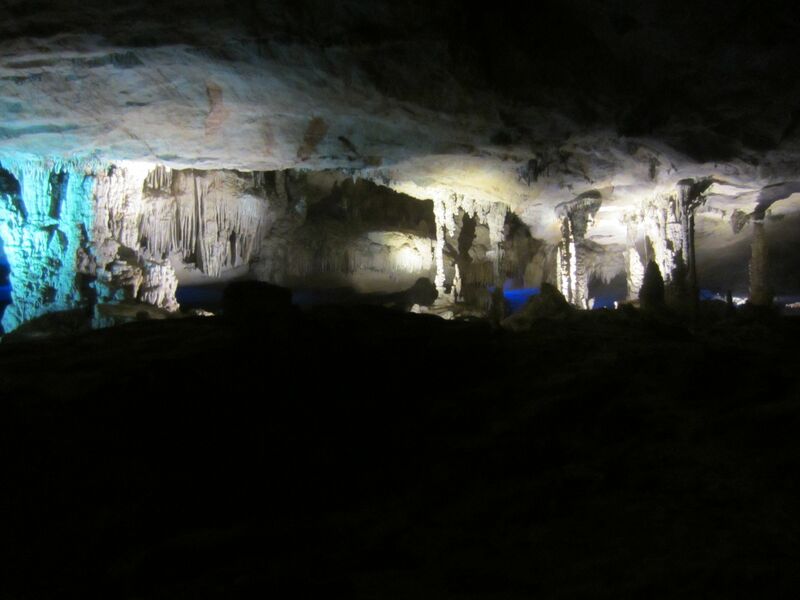 One of the loop’s highlights, besides the stunning scenery, is the Konglor Cave. 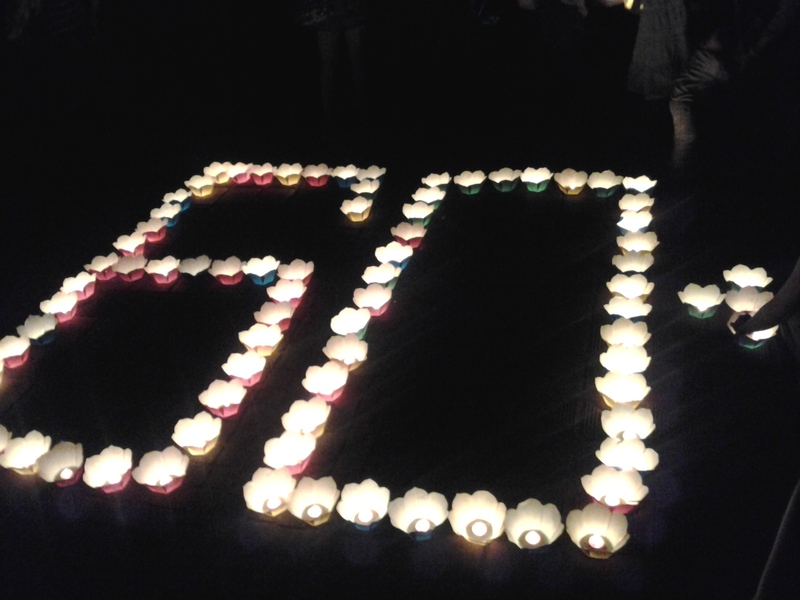 It is 7.5km long, and you travel through it in a boat, with 2 guides and flashlights. Knowing our camera would never do it justice, I have borrowed this image from Itchy Feet on the Cheap, who also has some other great pictures of the area. We arrived in the village by the cave in late afternoon, too late for a boat, but the perfect time for a swim in the lake at the mouth of the cave, full of clear water and striped fish. We had a lovely stay in the village of Kong Lor, at the Enjoy Boy Guesthouse (yes, interesting name), and we found the village friendly with eager, smiling children. Our final day was a long day of driving as we traveled the 200km back to Tha Khaek, half of that along the main road. While traffic in Laos is generally much less than places like Vietnam and Canada, and there were long stretches where we were the only ones on the road, there were still big trucks that made us nervous as they passed by us and each other. But we made it back completely unscathed, high-fiving our great and injury-free adventure. From the small and lovely Muong Ngoi, we ventured an hour downriver to the slightly larger Nuan Kiaw, a small town consisting mainly of homes annd shops gathered on each bank of the river, joined by a large bridge. We spent three nights here in a lovely, simple bungalow with a hammock in front, where I napped in the mid-day heat most days. Nuan Kiaw boasts several restaurants, including two authentic Indian ones, and we ate well. In fact, so far in Laos, it hasn’t been too difficult to maintain our vegetarianism, rather to my surprise. I can’t tell if it’s traditional or tourist influence, but most places we eat have lots of veg options. The majority of our meals have been some variation of rice (sticky, steame or fried) or noodles (stir fried or in soups) with vegetables and often tofu, as well as baguettes sandwiches with egg or veg. But anywhere with a significant tourist base has also had Indian, Thai, Chinese and Western foods. My favourite thing, though, his the fruit and fruit shakes: mango, banana, pineapple, passionfruit, oranges and watermelon are plentiful in the markets. 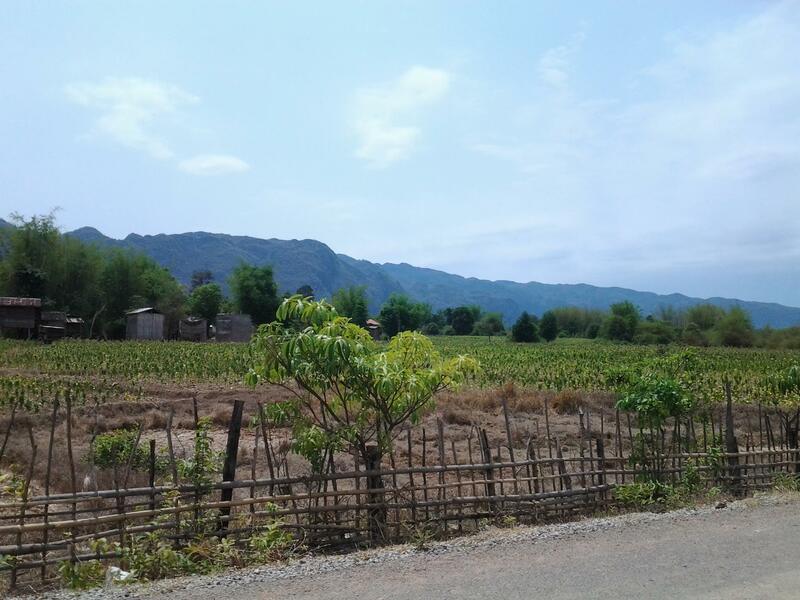 In Nuan Kiaw, we rented bicycles for half a day and explored some of the surrounding area passing through villages where the children called and waved to us, and we were chased by one dog, who was luckily was no match for the bikes. At the end of our morning, in the mid-day heat, we were able to go down the river to swim and cool off. That evening, the children at the local elementary school put on a small performance of three traditional dances, as a fundraiser for their learning centre, and we, along with many of the other tourists in town, turned up to watch. The next day, we joined a tour for the day that took us out to see two small villages then a 40 min trek to a waterfall, small now in the dry season but with enough water for a swimming hole. The return trip was in kayaks, with a few small but exciting passes over white water, and long stretches of silence on the Nam Ou river, appreciating some of the most beautiful scenery I’ve ever seen. The next day saw us on a bus to Luang Prabang, the old capital. 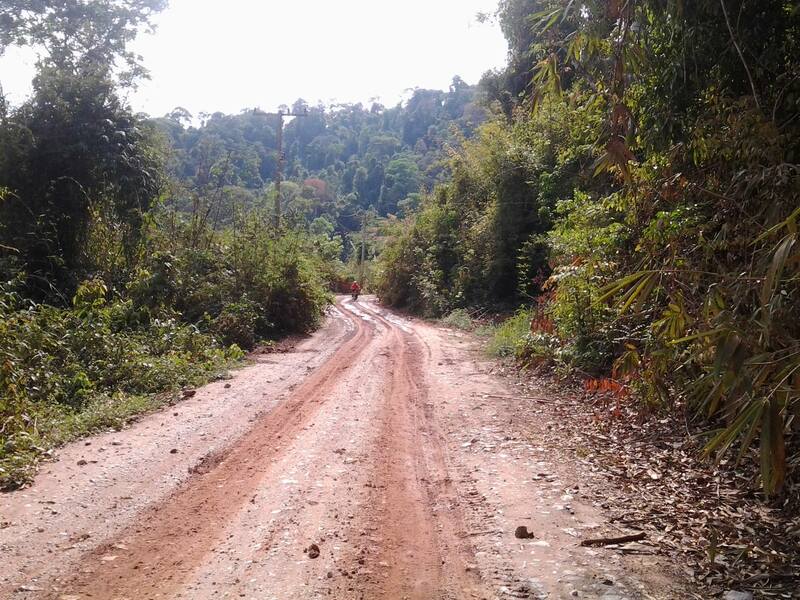 Roads through Laos, though few, have generally been in good condition for us, possibly because many are relatively new. 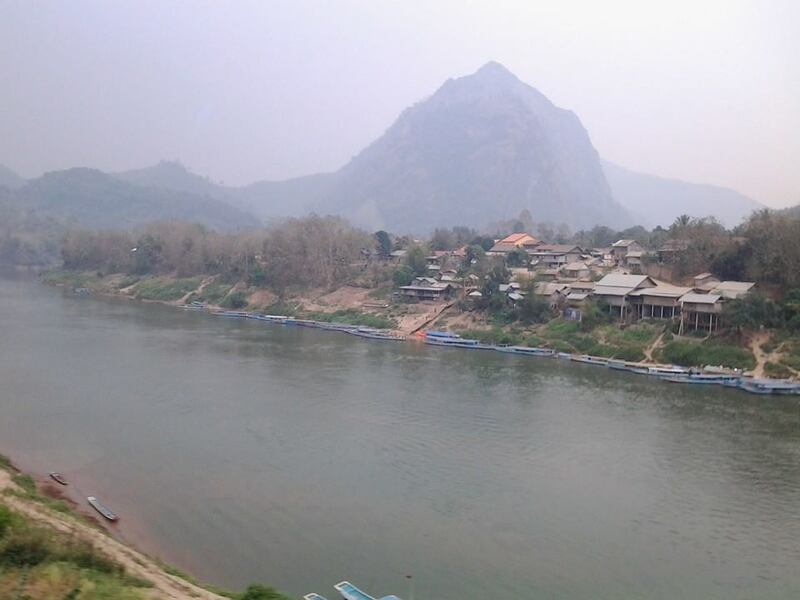 For centuries, most of northern Laos was only travelled by boat, and when you experience the roads, you can see why. Hardly 50m of road is straight at any given point, winding endlessly up and down and around mountains, and snake turn by turn continously. But there is little traffic and few potholes, so it’s not bad if you don’t get carsick! Luang Prabang is an old city, designated a UNESCO World Heritage Site, with dozens of buddhist temples (wats), a mixture of traditional Lao and French colonial architecture, and a large handicraft night market. After the quiet and calm of the towns and villages on the river, the busy atmosphere of the city, even a small city, had little appeal, so we stayed only 2 nights. We’d been told, however, that the waterfall outside of town was not to be missed, and it didn’t disappoint. We got to the falls early and avoided the crowds, climbing to the top of the many tiered falls, which were spectacular, and swam as the day heated up. 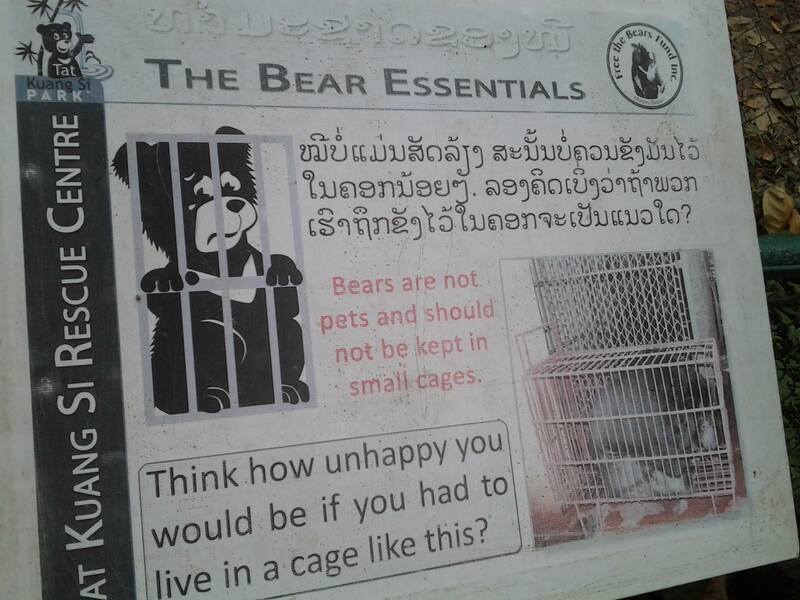 Near the falls was also a bear sanctuary, Free the Bears, where moon bears, rescued from poachers, live in large, nature-scaped enclosures. Having spent time with our friend Steve in Hanoi, who works for Animals Asia that does similar work, it was a neat experience. 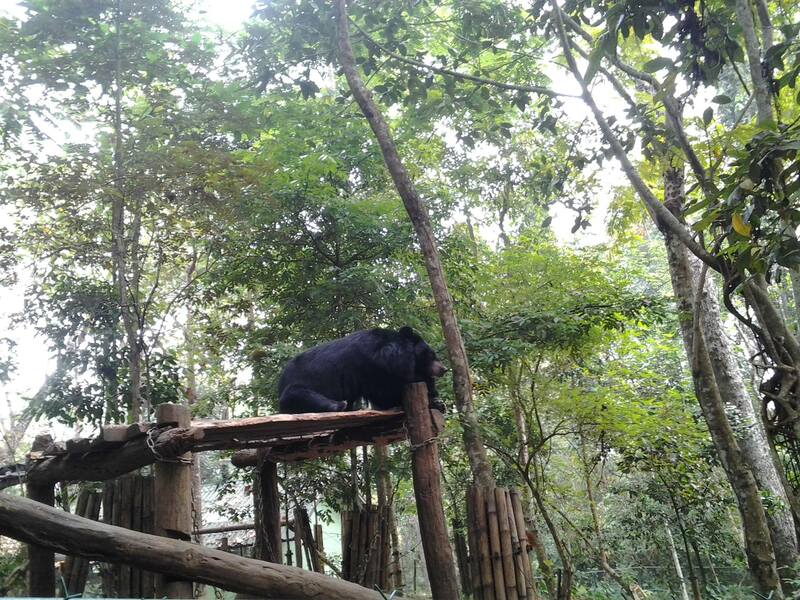 Moon bears are used in the cruel practice of bile extraction, kept in cages with tubes extracting bile from their gallbladders for traditional Chinese medicine, and these groups are working to rescue and rehabilitate bears, and educate people to end the practice. Our last evening and morning in Luang Prabang had us catching the sites, the national museum and the wat atop Mount Phousi, before boarding a bus once more. 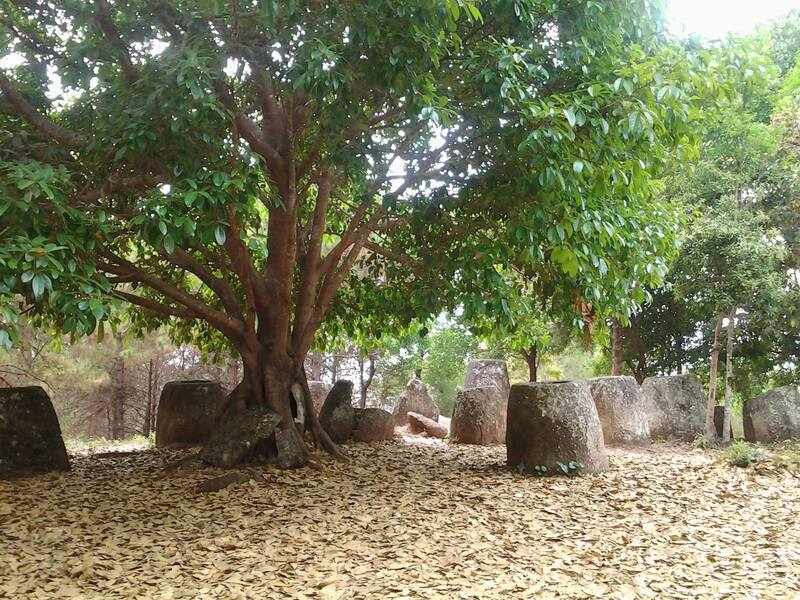 In Phongsavanh, we rented a motorbike for a day to explore the Plain of Jars, which are ancient stone jars scattered throughout the area. The area was bombed heavily during the Vietnam war, and the remenants are visible as craters and bomb casings on display, with info on the landmine clearing that took place. We had an interesting day, also visiting a village that produced spoons and other trinkets made of bomb metals. The town was not too exciting, though, and after one day, we got back on buses to head south. We started our adventures in busy Hanoi, luckily having the home of a friend of ours as a base to explore and get over our jet lag. Hanoi is kind of a crazy place, with an abundance of honking taxis and motorbikes and few traffic rules (at least the kind that I recognize). Hanoi is a pretty nice city, with an Old Quarter where you’re as likely as not to get lost in a maze of streets, each with its own theme. For example, on one road, every shop is selling sewing supplies; on another, things made of metal. We spent a few days exploring the city, sampling the noodles and coffees, and nervously negotiating crossing the streets. 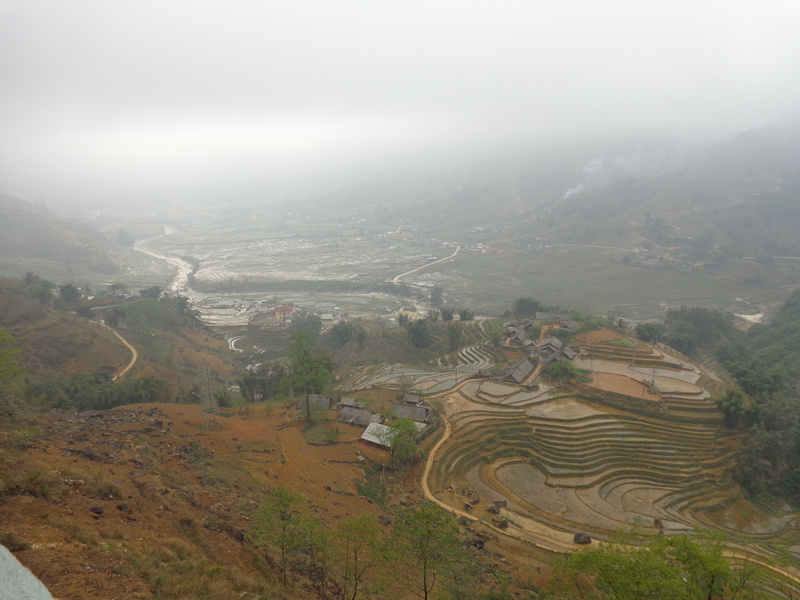 Interesting, but we were glad to escape the chaos on an overnight train to Sapa after a couple of days. Sapa is a mountain town popular with tourists. The fog at this time of year kept the town somewhat socked in, but a trek into the valley villages revealed hills of beautiful flooded rice paddies, as yet unplanted for the season. Local women from the H’mong ethnic minority followed our groups, selling handicrafts and sharing information about their villages and culture. After two days in Sapa, we embarked on a night bus towards Dien Bien Phu, at the Laos border. This was a main indication of the difference between travelling in my twenties and travelling in my thirties – no more night buses! Although this one was more comfortable than any I took in Africa, being woken up (from a not-real sleep) every couple of hours with blaring Vietnamese music and a good deal of shouting does not make for a good night. Still, we got to our destination and, after a nap, explored the town, with its wide streets, minimal traffic, and bunkers and monuments from the 1954 battle against the French colonial forces. About one week after we left Vancouver, we crossed into Laos, a long, tiring (although only about 70km) but fairly uneventful trip. 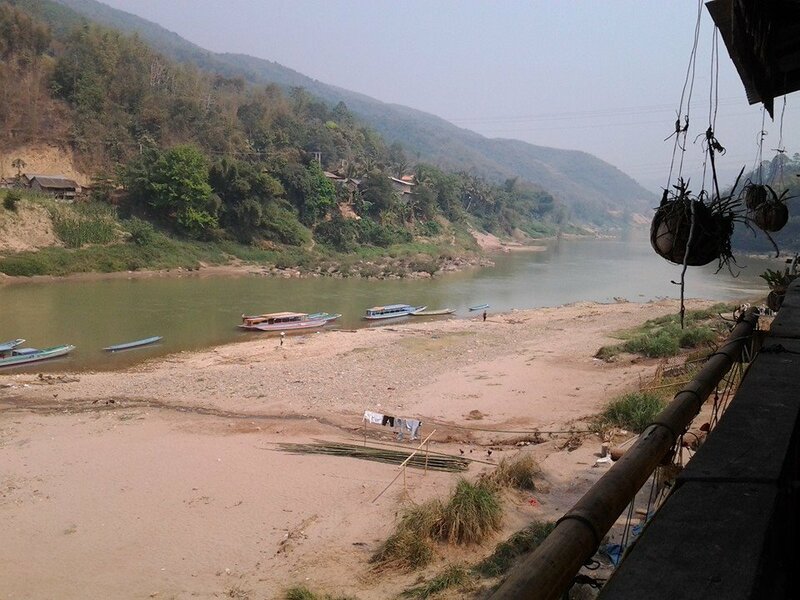 After a quiet night in a border town, Muang Khua, we took a stunning 3.5 hr boat trip down the Nam Ou river, passing tiny hamlets, swimming children and lounging water buffalo, under the backdrop of stunning jungle mountains. In Laos, we’ve finally hit the hotter weather, and the boat trip was a highlight. We came to rest in the village of Muang Ngoi, a small place with a high proportion of foreign tourists and bungalow guesthouses. It sits by the river, under dramatic mountains and while it seems like it should be a remote paradise but has been somewhat invaded by travellers. We also seemed to have timed our arrival with the funeral of a local monk, which meant all-night celebrations both nights we stayed. 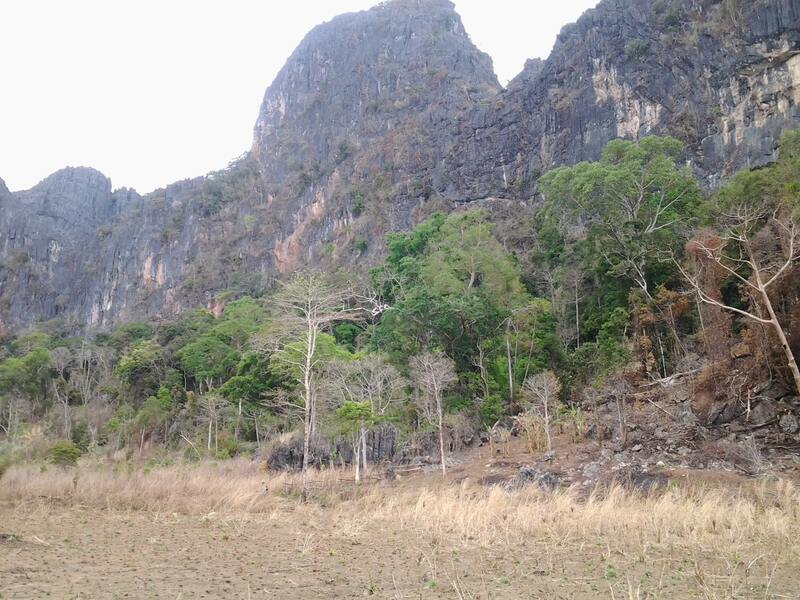 Still, staying in Muang Ngoi was lovely, and we did a small trek out to a tiny village, visiting a cave along the way. Although not especially long, about 2 hours, the trek was hot, and a smart woman at the entrance of the village knew what she was about when she saw us and called out, ‘cold beer!’ The villagers, used to white people walking thru, didn’t really bat an eye as we strolled past their bamboo huts. 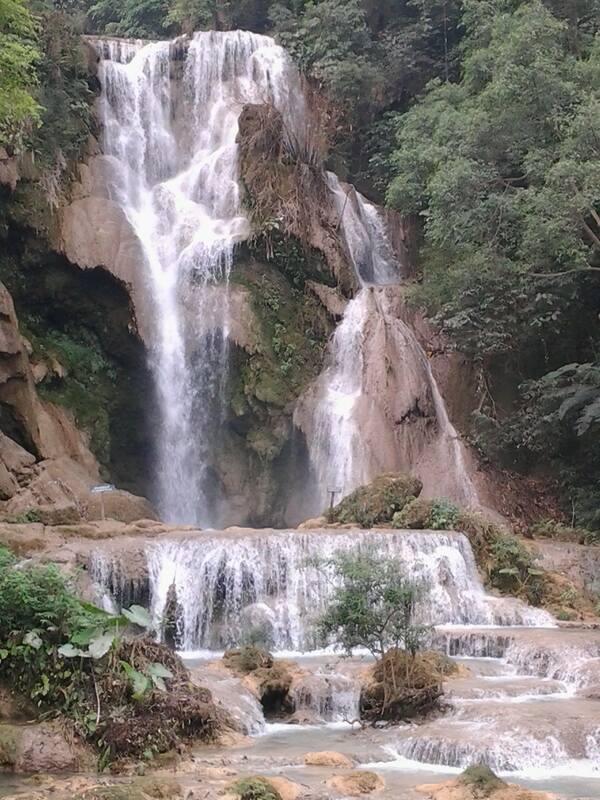 Laos, in general, is stunning and seemingly remote. The people are friendly, but standoff-ish, and they don’t harass travellers to buy things, which is nice. After hectic Vietnam, it is lovely and relaxing here. But you can see how much has changed over the last 5-10 years, and I was naively surprised at the throngs of travellers we see everywhere. 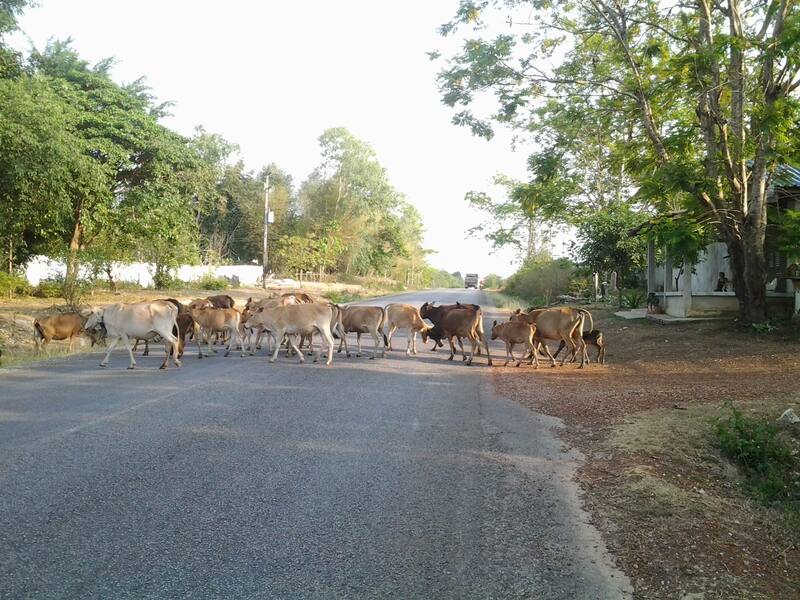 When I went to Thailand 10 years ago, Laos wasn’t on many itineraries, but with transport and road improvements, it has clearly become very popular. A great destination, but not the untouched paradise I’m sure it once was, and I have a feeling the local people wish it still was.